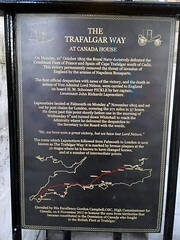 The Trafalgar Way is the name given to the historic route used to carry dispatches with the news of the Battle of Trafalgar overland from Falmouth to the Admiralty in London. The first messenger in November 1805 was Lieutenant John Richards Lapenotière, of HMS Pickle, who reached Falmouth on 4 November after a hard voyage in bad weather. He then raced to London bearing the dispatches containing the momentous news of Lord Nelson's victory and death in the Battle of Trafalgar on 21 October 1805. Following the death in action of the Commander in Chief, Admiral Lord Nelson, his deputy, Vice Admiral Cuthbert Collingwood, took command of the British Fleet. Because his ship, the Royal Sovereign, had been dismasted, Collingwood transferred to the undamaged frigate HMS Euryalus to control operations. Shortly after the battle a severe storm blew up and lasted for several days. Collingwood was faced with the challenge of ensuring the safety and survival of his own and the captured ships: at the same time he needed to report the outcome of the battle to the Admiralty in London as soon as possible. The Trafalgar Way. Tedburn St Mary. The Trafalgar Way Dorchester - 11th post-horse change On Monday 21st October 1805 the Royal Navy decisively defeated a combined French and Spanish fleet off Cape Trafalgar on the south west coast of Spain. This victory permanently removed the threat of invasion of England by the armies of Napoleon Bonaparte. The first official dispatches with the momentous news of the victory, and the death in action of Vice Admiral Lord Nelson, were carried to England on board H.M. Schooner PICKLE by her captain, Lieutenant John Richards Lapenotiere. Lapenotiere landed at Falmouth on Monday 4th November 1805 and set out "express by post-chaise" for London, following what is now The Trafalgar Way. He took some 37 hours to cover the 271 mile journey, changing horses 21 times. The 11th such change was made at Dorchester on the morning of 5th November at a cost of two pounds fourteen shillings and sixpence. Lapenotiere delivered his dispatches to the Admiralty at 1 a.m. on Wednesday 6th November. The news was at once passed to the Prime Minister and the King, and special editions of newspapers were published later the same day to inform the nation. The Trafalgar Way. Truro - first post-horse change. On Monday 21st October 1805 the Royal Navy decisively defeated a combined French and Spanish fleet off Cape Trafalgar on the south west coast of Spain. This victory permanently removed the threat of invasion of England by the armies of Napoleon Bonaparte. The first official dispatches with the momentous news of the victory, and the death in action of Vice Admiral Lord Nelson, were carried on board H.M. Schooner PICKLE by her captain Lieutenant John Richards Lapenotiere. Lapenotiere landed at Falmouth on Monday 4th November 1805 and set out "express by post-chaise" for London, following what is now known as The Trafalgar Way.He took some 37 hours to cover the 271 mile journey, changing horses 21 times. The first such change was made at Truro that afternoon at a cost of one pound two shillings and sixpence. Lapenotiere delivered his despatches to the Admiralty at 1a.m. on Wednesday 6th November. The news was at once passed to the Prime Minister and the King and special editions of newspapers were published later the same day to inform the nation. The Trafalgar Way. Crockernwell - 6th post-horse change. On Monday 21st October 1805 the Royal Navy decisively defeated a combined French and Spanish fleet off Cape Trafalgar on the south west coast of Spain. This victory permanently removed the threat of invasion of England by the armies of Napoleon Bonaparte. The first official dispatches with the momentous news of the victory,and the death in action of Vice Admiral Lord Nelson,were carried on board H.M. Schooner PICKLE by her captain Lieutenant John Richards Lapenotiere. Lapenotiere landed at Falmouth on Monday 4th November 1805 and set out "express by post-chaise" for London, following what is now known as The Trafalgar Way. He took some 37 hours to cover the 271 mile journey, changing horses 21 times. The 6th such change was made at Crockernwell very early on 5th November at a cost of one pound sixteen shillings and sixpence. Lapenotiere delivered his despatches to the Admiralty at 1a.m. on Wednesday 6th November. The news was at once passed to the Prime Minister and the King and special editions of newspapers were published later the same day to inform the nation. The Trafalgar Way. Destination - The Admiralty. On Monday 21st October 1805 the Royal Navy decisively defeated a combined French and Spanish fleet off Cape Trafalgar on the south west coast of Spain. This victory permanently removed the threat of invasion of England by the armies of Napoleon Bonaparte. The first official dispatches with the momentous news of the victory,and the death in action of Vice Admiral Lord Nelson,were carried on board H.M. Schooner PICKLE by her captain Lieutenant John Richards Lapenotiere. Lapenotiere landed at Falmouth on Monday 4th November 1805 and set out "express by post-chaise" for London, following what is now The Trafalgar Way. He took some 37 hours to cover the 271 mile journey, changing horses 21 times, at a total cost of £46 19s 1d. Lapenotiere delivered his dispatches here to the Secretary of the Admiralty, William Marsden, at 1 a.m. on Wednesday 6th. Shortly thereafter a summary of the news was posted here and a crowd soon gathered. The news was passed to the Prime Minister and the King at once and special editions of newspapers were published later the same day to inform the nation. The Trafalgar Way. Brentford & Chiswick. On Monday 21st October 1805 the Royal Navy decisively defeated a combined French and Spanish fleet off Cape Trafalgar on the south west coast of Spain. This victory permanently removed the threat of invasion of England by the armies of Napoleon Bonaparte. The first official dispatches with the momentous news of the victory,and the death in action of Vice Admiral Lord Nelson,were carried on board H.M. Schooner PICKLE by her captain Lieutenant John Richards Lapenotiere. Lapenotiere landed at Falmouth on Monday 4th November 1805 and set out "express by post-chaise" for London, following what is now known as The Trafalgar Way. He took some 37 hours to cover the 271 mile journey, changing horses 21 times. The last of these was at Hounslow late at night on Tuesday 5th. His orders were to lose no time in reaching the Admiralty so, as the horses were still fresh, he pressed on through fog in Brentford and Chiswick towards Whitehall. Over the following four weeks other important messages arrived from the fleet with further details of the victory and anxiously awaited information on casualties. All the dispatches were landed at Falmouth and their couriers took the same route through Brentford and Chiswick where horses and hospitality were available from the inns to all travellers on what is now The Trafalgar Way. The Trafalgar Way. Bagshot - 19th post-horse change. On Monday 21st October 1805 the Royal Navy decisively defeated a combined French and Spanish fleet off Cape Trafalgar on the south west coast of Spain. This victory permanently removed the threat of invasion of England by the armies of Napoleon Bonaparte. The first official dispatches with the momentous news of the victory,and the death in action of Vice Admiral Lord Nelson,were carried on board H.M. Schooner PICKLE by her captain Lieutenant John Richards Lapenotiere. Lapenotiere landed at Falmouth on Monday 4th November 1805 and set out "express by post-chaise" for London, following what is now known as The Trafalgar Way. He took some 37 hours to cover the 271 mile journey, changing horses 21 times. The ?th such change was made at Bagshot on 5th November at a cost of one pound sixteen shillings and sixpence. Lapenotiere delivered his despatches to the Admiralty at 1a.m. on Wednesday 6th November. The news was at once passed to the Prime Minister and the King and special editions of newspapers were published later the same day to inform the nation. The Trafalgar Way. Salisbury - 14th post-horse change. On Monday 21st October 1805 the Royal Navy decisively defeated a combined French and Spanish fleet off Cape Trafalgar on the south west coast of Spain. This victory permanently removed the threat of invasion of England by the armies of Napoleon Bonaparte. The first official dispatches with the momentous news of the victory,and the death in action of Vice Admiral Lord Nelson,were carried on board H.M. Schooner PICKLE by her captain Lieutenant John Richards Lapenotiere. Lapenotiere landed at Falmouth on Monday 4th November 1805 and set out "express by post-chaise" for London, following what is now known as The Trafalgar Way. He took some 37 hours to cover the 271 mile journey, changing horses 21 times. The 14th such change was made at Salisbury on the afternoon of 5th November at a cost of one pound seventeen shillings and sixpence. Lapenotiere delivered his despatches to the Admiralty at 1a.m. on Wednesday 6th November. The news was at once passed to the Prime Minister and the King and special editions of newspapers were published later the same day to inform the nation. The Trafalgar Way. Woodyates - 13th post-horse change. On Monday 21st October 1805 the Royal Navy decisively defeated a combined French and Spanish fleet off Cape Trafalgar on the south west coast of Spain. This victory permanently removed the threat of invasion of England by the armies of Napoleon Bonaparte. The first official dispatches with the momentous news of the victory,and the death in action of Vice Admiral Lord Nelson,were carried on board H.M. Schooner PICKLE by her captain Lieutenant John Richards Lapenotiere. Lapenotiere landed at Falmouth on Monday 4th November 1805 and set out "express by post-chaise" for London, following what is now known as The Trafalgar Way. He took some 37 hours to cover the 271 mile journey, changing horses 21 times. The 14th such change was made at Salisbury on the afternoon of 5th November at a cost of one pound seventeen shillings and sixpence. Lapenotiere delivered his despatches to the Admiralty at 1a.m. on Wednesday 6th November. The news was at once passed to the Prime Minister and the King and special editions of newspapers were published later the same day to inform the nation. The Trafalgar Way. Wilmington. On Monday 21st October 1805 the Royal Navy decisively defeated a combined French and Spanish fleet off Cape Trafalgar on the south west coast of Spain. This victory permanently removed the threat of invasion of England by the armies of Napoleon Bonaparte. The first official dispatches with the momentous news of the victory,and the death in action of Vice Admiral Lord Nelson,were carried on board H.M. Schooner PICKLE by her captain Lieutenant John Richards Lapenotiere. Lapenotiere landed at Falmouth on Monday 4th November 1805 and set out "express by post-chaise" for London, following what is now known as The Trafalgar Way. He took some 37 hours to cover the 271 mile journey, changing horses 21 times, one of these being early on the 5th at Honiton. His orders were to lose no time in reaching the Admiralty so, as the horses were still fresh, he pressed on through fog in Brentford and Chiswick towards Whitehall. Over the following four weeks other important messages arrived from the fleet with further details of the victory and anxiously awaited information on casualties. All the dispatches were landed at Falmouth and their couriers took the same route through Brentford and Chiswick where horses and hospitality were available from the inns to all travellers on what is now The Trafalgar Way. The Trafalgar Way. Axminster - 9th post-horse change On Monday 21st October 1805 the Royal Navy decisively defeated a combined French and Spanish fleet off Cape Trafalgar on the south west coast of Spain. This victory permanently removed the threat of invasion of England by the armies of Napoleon Bonaparte. The first official dispatches with the momentous news of the victory, and the death in action of Vice Admiral Lord Nelson, were carried to England on board H.M. Schooner PICKLE by her captain, Lieutenant John Richards Lapenotiere. Lapenotiere landed at Falmouth on Monday 4th November 1805 and set out "express by post-chaise" for London, following what is now The Trafalgar Way. He took some 37 hours to cover the 271 mile journey, changing horses 21 times. The 11th such change was made at Dorchester on the morning of 5th November at a cost of two pounds fourteen shillings and sixpence. Lapenotiere delivered his dispatches to the Admiralty at 1 a.m. on Wednesday 6th November. The news was at once passed to the Prime Minister and the King, and special editions of newspapers were published later the same day to inform the nation. The Trafalgar Way. Lifton. On Monday 21st October 1805 the Royal Navy decisively defeated a combined French and Spanish fleet off Cape Trafalgar on the south west coast of Spain. This victory permanently removed the threat of invasion of England by the armies of Napoleon Bonaparte. The first official dispatches with the momentous news of the victory, and the death in action of Vice Admiral Lord Nelson, were carried to England on board H.M. Schooner PICKLE by her captain, Lieutenant John Richards Lapenotiere. Lapenotiere landed at Falmouth on Monday 4th November 1805 and set out "express by post-chaise" for London, following what is now The Trafalgar Way. He took some 37 hours to cover the 271 mile journey, changing horses 21 times, one of those times being that night in Launceston. His orders were to lose no time in reaching The Admiralty so, as the horses were still fresh, he sped on through Lifton to Okehampton. Over the following four weeks other important messages arrived from the fleet with further details of the victory and anxiously awaited information on casualties. All the dispatches were landed at Falmouth and their couriers took the same route through Lifton, where fresh horses and hospitality were available from the inns to all travellers on what is now The Trafalgar Way. The Trafalgar Way. Kensington. On Monday 21st October 1805 the Royal Navy decisively defeated a combined French and Spanish fleet off Cape Trafalgar on the south west coast of Spain. This victory permanently removed the threat of invasion of England by the armies of Napoleon Bonaparte. The first official dispatches with the momentous news of the victory,and the death in action of Vice Admiral Lord Nelson,were carried on board H.M. Schooner PICKLE by her captain Lieutenant John Richards Lapenotiere. Lapenotiere landed at Falmouth on Monday 4th November 1805 and set out "express by post-chaise" for London, following what is now known as The Trafalgar Way. He took some 37 hours to cover the 271 mile journey, changing horses 21 times, one of these being very late on 5th November at Hounslow. His orders were to lose no time in reaching the Admiralty so, as the horses were not yet spent, he made what speed he could through Kensington in a dense fog towards his final destination. Over the following four weeks other important messages arrived from the fleet with further details of the victory and anxiously awaited information on casualties. All the dispatches were landed at Falmouth and their couriers took the same route through Kensington where horses and hospitality were available from the inns to all travellers on what is now The Trafalgar Way. The Trafalgar Way. Fraddon - 2nd post-horse change. On Monday 21st October 1805 the Royal Navy decisively defeated a combined French and Spanish fleet off Cape Trafalgar on the south west coast of Spain. This victory permanently removed the threat of invasion of England by the armies of Napoleon Bonaparte. The first official dispatches with the momentous news of the victory,and the death in action of Vice Admiral Lord Nelson,were carried on board H.M. Schooner PICKLE by her captain Lieutenant John Richards Lapenotiere. Lapenotiere landed at Falmouth on Monday 4th November 1805 and set out "express by post-chaise" for London, following what is now known as The Trafalgar Way. He took some 37 hours to cover the 271 mile journey, changing horses 21 times, one of these being early on the 5th at Honiton. His orders were to lose no time in reaching the Admiralty so, as the horses were still fresh, he pressed on through fog in Brentford and Chiswick towards Whitehall. Over the following four weeks other important messages arrived from the fleet with further details of the victory and anxiously awaited information on casualties. All the dispatches were landed at Falmouth and their couriers took the same route through Brentford and Chiswick where horses and hospitality were available from the inns to all travellers on what is now The Trafalgar Way. The Trafalgar Way. Bodmin - 3rd post-horse change. On Monday 21st October 1805 the Royal Navy decisively defeated a combined French and Spanish fleet off Cape Trafalgar on the south west coast of Spain. This victory permanently removed the threat of invasion of England by the armies of Napoleon Bonaparte. The first official dispatches with the momentous news of the victory,and the death in action of Vice Admiral Lord Nelson,were carried on board H.M. Schooner PICKLE by her captain Lieutenant John Richards Lapenotiere. Lapenotiere landed at Falmouth on Monday 4th November 1805 and set out "express by post-chaise" for London, following what is now known as The Trafalgar Way. He took some 37 hours to cover the 271 mile journey, changing horses 21 times, one of these being early on the 5th at Honiton. His orders were to lose no time in reaching the Admiralty so, as the horses were still fresh, he pressed on through fog in Brentford and Chiswick towards Whitehall. Over the following four weeks other important messages arrived from the fleet with further details of the victory and anxiously awaited information on casualties. All the dispatches were landed at Falmouth and their couriers took the same route through Brentford and Chiswick where horses and hospitality were available from the inns to all travellers on what is now The Trafalgar Way. The Trafalgar Way at Canada House On Monday 21st October 1805 the Royal Navy decisively defeated a combined French and Spanish fleet off Cape Trafalgar south of Cadiz. This victory permanently removed the threat of invasion of England by the armies of Napoleon Bonaparte. The first official dispatches with news of the victory, and the death of Vice Admiral Lord Nelson, were carried to England on board H.M. Schooner PICKLE by her captain, Lieutenant John Richards Lapenotiere. Lapenotiere landed at Falmouth on Monday 4th November 1805 and set out by post-chaise for London, covering the 271 miles in 37 hours. He drove past this point shortly before one in the morning of Wednesday 6th and turned down Whitehall to reach the Admiralty where he delivered the despatches to the Secretary to the Board with the words, "Sir, we have won a great victory, but have lost Lord Nelson." 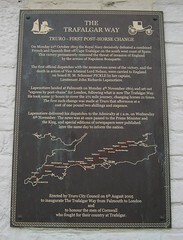 he route which Lapenotiere followed from Falmouth to London is now known as The Trafalgar Way: it is marked by bronze plaques at the 21 stages where he is known to have changed horse, and at a number of intermediate points. The Trafalgar Way Sticklepath On Monday 21st October 1805 the Royal Navy decisively defeated a combined French and Spanish fleet off Cape Trafalgar on the south west coast of Spain. This victory permanently removed the threat of invasion of England by the armies of Napoleon Bonaparte. The first official dispatches with the momentous news of the victory, and the death in action of Vice Admiral Lord Nelson, were carried to England on board H.M. Schooner Pickle by her captain, Lieutenant John Richards Lapenotiere. Lapenotiere landed at Falmouth on Monday 4th November 1805 and set out "express by post-chaise" for London. He took some 37 hours on the 271 mile journey, changing horses 21 times, one of these being very early on 5th at Okehampton. His orders were to lose no time in reaching the Admiralty so, as the horses were still fresh, he sped on through Sticklepath towards Crockernwell. Over the following four weeks other important messages arrived from the fleet with further details of the victory and anxiously awaited information on casualties. All the dispatches were landed at Falmouth and their couriers took the same route through Sticklepath where fresh horses and hospitality were available from the inns to all travellers on what is now The Trafalgar Way. Erected by Sticklepath Parish Council on 16th August 2005 to inaugurate The Trafalgar Way from Falmouth to London and to honour the men of Sticklepath and Dartmoor who fought for their country at Trafalgar. The Trafalgar Way Exeter - 7th Post-horse Change On Monday 21st October 1805 the Royal Navy decisively defeated a combined French and Spanish fleet off Cape Trafalgar on the south west coast of Spain. This victory permanently removed the threat of invasion of England by the armies of Napoleon Bonaparte. The first official dispatches with the momentous news of the victory, and the death in action of Vice Admiral Lord Nelson, were carried to England on board H.M. Schooner Pickle by her captain, Lieutenant John Richards Lapenotiere. Lapenotiere landed at Falmouth on Monday 4th November 1805 and set out "express by post-chaise" for London, following what is now The Trafalgar Way. He took some 37 hours to cover the 271 mile journey, changing horses 21 times. The 7th such change was made at Exeter very early on 5th November at a cost of one pound seventeen shillings and sixpence. Lapenotiere delivered his dispatches to the Admiralty at 1a.m on Wednesday 6th November. The news was at once passed to the Prime Minister and the King, and special editions of newspapers were published later the same day to inform the nation. Erected by Exeter City Council on 17th August 2005 to inaugurate The Trafalgar Way from Falmouth to London and to honour the men of Exter who fought for their country at Trafalgar. The Trafalgar Way Blandford Forum - 12th Post-horse Change On Monday 21st October 1805 the Royal Navy decisively defeated a combined French and Spanish fleet off Cape Trafalgar on the south west coast of Spain. This victory permanently removed the threat of invasion of England by the armies of Napoleon Bonaparte. The first official dispatches with the momentous news of the victory, and the death in action of Vice Admiral Lord Nelson, were carried to England on board H.M. Schooner Pickle by her captain, Lieutenant John Richards Lapenotiere. Lapenotiere landed at Falmouth on Monday 4th November 1805 and set out "express by post-chaise" for London, following what is now The Trafalgar Way. He took some 37 hours on the 271 mile journey, changing horses 21 times. The 12th such change was made at Blandford Forum in the middle of the day on 5th November at a cost of two pounds ten shillings and sixpence. Lapenotiere delivered his dispatches to the Admiralty at 1a.m on Wednesday 6th November. The news was passed to the Prime Minister and the King at once, and special editions of newspapers were published later the same day to inform the nation. Erected by Blandford Forum Town Council on 25th August 2005 to inaugurate The Trafalgar Way from Falmouth to London and to honour the men of Blandford Forum and North Dorset who fought for their country at Trafalgar. The Trafalgar Way Andover - 15th Post Chaise Horse Change On Monday 21st October 1805 the Royal Navy decisively defeated a combined French and Spanish fleet off Cape Trafalgar on the south west coast of Spain. This victory permanently removed the threat of invasion of England by the armies of Napoleon Bonaparte. The first official dispatches with the momentous news of the victory, and the death in action of Vice Admiral Lord Nelson, were carried to England on board H.M. Schooner Pickle by her captain, Lieutenant John Richards Lapenotiere. Lapenotiere landed at Falmouth on Monday 4th November 1805 and set out "express by post-chaise" for London. He took some 37 hours on the 271 mile journey, changing horses 21 times. The 15th such change was made at Andover in the late afternoon of 5th November at a cost of two pounds fifteen shillings. Lapenotiere delivered his dispatches to the Admiralty at 1a.m on Wednesday 6th November. The news was at once passed to the Prime Minister and the King, and special editions of newspapers were published later the same day to inform the nation. Erected by Test Valley Borough Council on 1st September 2005 to inaugurate The Trafalgar Way from Falmouth to London and to honour the men of Andover who fought for their country at Trafalgar. The Trafalgar Way. Egham On Monday 21st October 1805 the Royal Navy decisively defeated a combined French and Spanish fleet off Cape Trafalgar on the south west coast of Spain. This victory permanently removed the threat of invasion of England by the armies of Napoleon Bonaparte. The first official dispatches with the momentous news of the victory, and the death in action of Vice Admiral Lord Nelson, were carried to England on board H.M. Schooner Pickle by her captain, Lieutenant John Richards Lapenotiere. Lapenotiere landed at Falmouth on Monday 4th November 1805 and set out "express by post-chaise" for London. He took some 37 hours on the 271 mile journey, changing horses 21 times. One of these being late on 5th November at Bagshot. His orders were to lose no time in reaching the Admiralty so, as the horses were not yet spent, he sped on through Egham towards Staines. Over the following four weeks other important messages arrived from the fleet with further details of the victory and anxiously awaited information on casualties. All the dispatches were landed at Falmouth and their couriers took the same route through Egham, where horses and hospitality were available from the inns to all travellers on what is now The Trafalgar Way. Erected by Runnymede Borough Council and the Loch Fyne Restaurant to commemorate the bicentenary of the Battle, to inaugurate The Trafalgar Way from Falmouth to London and to honour the men of Surrey who fought for their country at Trafalgar. The Trafalgar Way Staines - 20th Post-horse change On Monday 21st October 1805 the Royal Navy decisively defeated a combined French and Spanish fleet off Cape Trafalgar on the south west coast of Spain. This victory permanently removed the threat of invasion of England by the armies of Napoleon Bonaparte. The first official dispatches with the momentous news of the victory, and the death in action of Vice Admiral Lord Nelson, were carried to England on board H.M. Schooner Pickle by her captain, Lieutenant John Richards Lapenotiere. Lapenotiere landed at Falmouth on Monday 4th November 1805 and set out "express by post-chaise" for London. He took some 37 hours on the 271 mile journey, changing horses 21 times. The 20th such change was made at Staines late on 5th November at a cost of one pound seventeen shillings and sixpence. Lapenotiere delivered his dispatches to the Admiralty at 1a.m on Wednesday 6th November. The news was at once passed to the Prime Minister and the King, and special editions of newspapers were published later the same day to inform the nation. Erected by Spelthorne Borough Council on 4th September 2005 to inaugurate The Trafalgar Way from Falmouth to London and to honour the men of Surrey who fought for their country at Trafalgar.